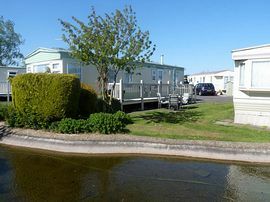 Skegness Caravan Holiday Rentals have a family owned caravan to rent or hire,on the beautiful East coast of Lincolnshire. Steve and Teresa have been offering a warm welcome since 2011. 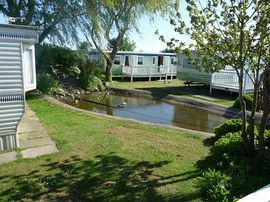 Our privately owned accommodation is in the well known and respected South View Leisure Holiday Park. We welcome children and pets, so you can bring the whole family with the confidence of a hassle free holiday. 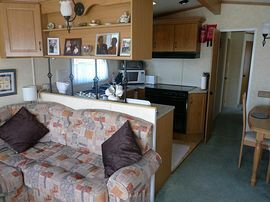 Most caravans aren't child,dog or pet friendly. Being parents and pet owners ourselves we love them. Our caravan holiday is near to the town centre with a regular bus service on to Fantasy Island. A mainline station serves, Grantham ,Nottingham, The North of England, Scotland, The Midlands and London. 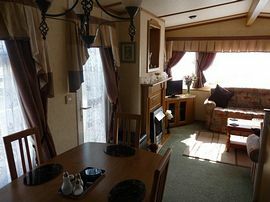 The caravan comprises a main bedroom with en-suite and TV, twin bedroom with 2 beds and TV, single bedroom with TV, lounge area with double bed settee, family bathroom with shower, fully equipped kitchen and dining room. South View Leisure Park has lots of on-site facilities, including a 9-hole golf course, 2 fishing lakes, a leisure centre with a swimming pool, gym, sauna, sunbeds, snooker table, sports TV and Wi-Fi. Family entertainment is provided for all ages by the on site team, including children's daytime activities, evening disco and live shows. Food is available in the restaurant and also to take away. Skegness is a short 10 minute drive away and we are close to the Welcome pub, regular car boot sales and all the seaside goodies. Dogs welcome and open 10 months a year. Low cost weeks and weekends. Yes Small Dogs Only Please. Local Services: Full on site Entertainment, Swimming, Shop, Bar,Cafe. By Car: In Skegness take Burgh Road to Burgh Le Marsh, 5 minute drive to Southview Leisure Park. See map. By Bus: Take the No6A to the park. All Prices Please Add £20 for a small dog. March 2012 £180 A Week or £80 A Weekend. April 2012 £180 A Week or £80 A Weekend. May 2012 £180 A Week or £100 A Weekend. 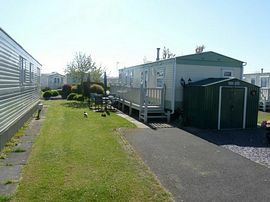 May 5th 2012 Bank Holiday Week £225. June 2012 £320 A Week. June 2nd £380 Bank Holiday. July 2012 £380 A Week. August 2012 £400 A Week. August 25th Bank Holiday £425. September 2012 £280 A Week. October 2012 £200 A Week. November 2012 £150 A Week. December 2012 £150 A Week. Please see our website customer review pages.